This is one of a series that grows out of my fascination with Orthodox icons. The icon within this religious context is thought to be a kind of spiritual window that brings together the flesh of the saint with the eternal glory of God – who is represented by the gold ground. In the icon the mystery of the word being made flesh is apparent. Orthodoxy holds that the human body is the vehicle through which the mystery of salvation was accomplished. The prominence of icons within this tradition can be understood as an extension of a worldview that places the enfleshment of God, the Incarnation, at the very heart of the Biblical story. Since the Reformation, Protestants have critiqued, often with sabers waving, the practice of venerating Christ and the Saints through icons as a form of idolatry. In the reformed tradition, where the Bible as written word became the domain of the Protestant Imagination, this was translated into a rich literary tradition that, in the words of John Calvin, formed mental images far superior to the “perception of our eyes”. Of course, the line between icon and idolatry is one that can be crossed in any tradition. The “magical” quality some Protestant traditions assign to the words of scripture comes very close to bibliolatry. 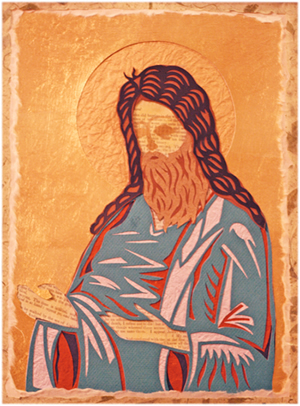 These works explore this tension between icon and iconoclasm by re-writing the great icons of Orthodoxy as layers of biblical text and paper. Built, rather than written, with layers of paper, these icons replace the flesh of the saints with pages from an 18th century bible. The biblical pages, barely readable under a thick film of gauze and gold dust are also the deepest layer in these “icons”. These works fall somewhere between an outsider’s homage to a profound and mysterious spiritual tradition and a postmodern flirtation with the tension between icon and idolatry. – Chris Cuthill serves as Art Chair at Redeemer University College, Ancaster, Ontario, where he teaches courses in Art Theory, Art History and Popular Culture. He has worked professionally in the theatre, as a graphic artist and as an art curator.